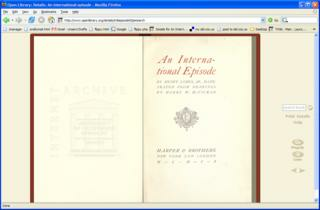 Last night at the Internet Archive we released what we have been working on lately, an Open Library. It's an initiative to scan all of the world's books, starting with public domain ones. 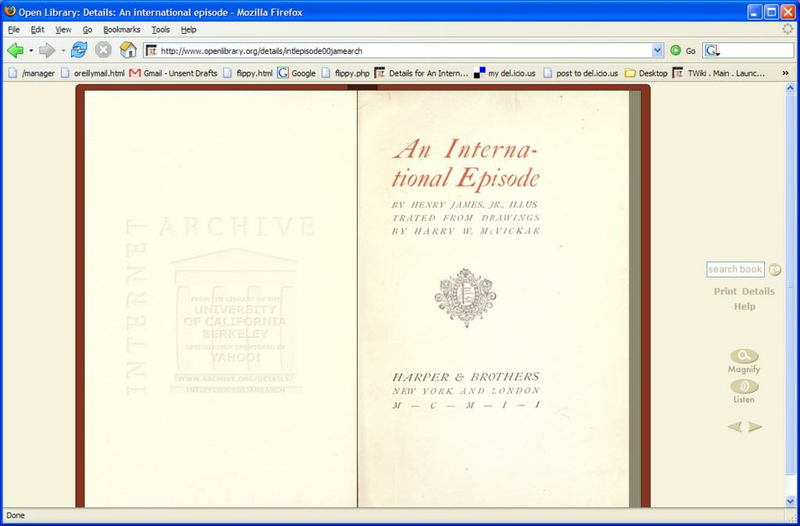 The Internet Archive team has created an entire pipeline and process to affordably scan books at ten cents a page, involving book scanning machines, workflow software to transform book images into text and high quality images, algorithms to correct page quality, systems to be able to store the petabytes of information for all these books, and finally a web-based AJAX system to view and fully search these books. I was brought on the last three weeks to finish the web-based AJAX book viewer, known as the Flipbook, before last night's launch. Huge amounts of work on the Flipbook viewer were also done by Jesse Crossen and Kevin Webb, including server-side work by Ralf Muehlen and Tracey Jaquith. Graphic design was done by the awesome Ronna Tanenbaum. 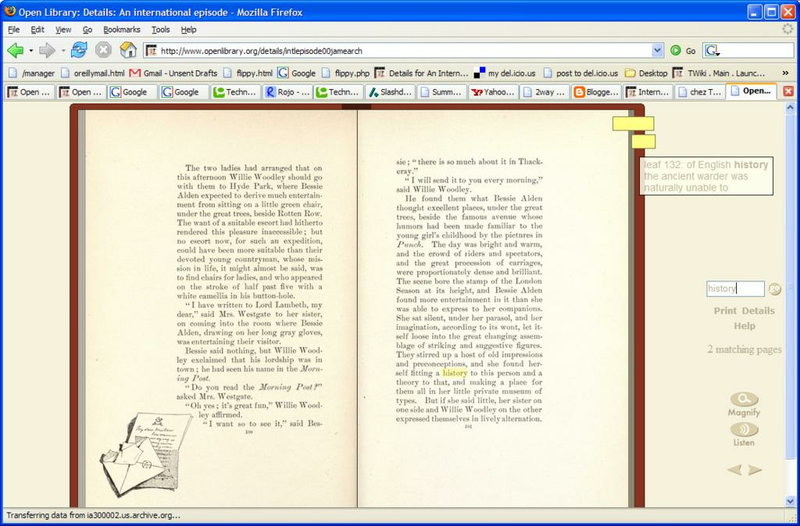 The Flipbook viewer is a full, web-based AJAX viewer for digital books, real books that were scanned using the Internet Archive's scanning machines. Jesse Crossen created an amazing page turning effect as you are reading the book. 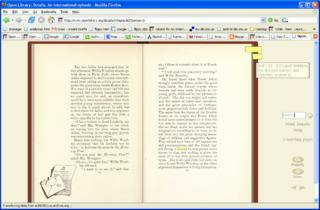 We've also added unique searching features; enter the word "history" in the book above, for example, and the Flipbook viewer queries the server in the background, which uses Optical Character Recognition information to find matches and the coordinates of every page in the book, and which returns the results to the client. The client then uses this information to highlight in place every matching word, positioning a transparent rectangle over all matching words. These are the kinds of cool things you can start doing when you bring books into the digital realm. The Flipbook also has print on demand features, audio narration, keyboard navigation, full metadata in balloon popups that appear, and more. It's the beginnings of an AJAXian Dynabook. Its a neat application but the text in the books is too small for me. Can you provide an option to increase the size of the books? This is a great effort. However the last step is missing: converting those images to pure ascii (and/or html) format via OCR, a la Project Gutenberg and making those files available for download. eBook market (i.e. people actually reading eBooks) is pretty much limited to mobile devices (Palm/Pocket PC/Symbian PDAs and smartphones). Those devices, mostly due to screen size, are terrible at displaying images or PDF files so all the richness of Open Library is unavailable to them. A pure ascii, while not preserving extras like images or fancy formatting, is something that can be viewed in a reasonable way on mobile devices. Great work Brad. Once the magnify comes online should be good. I'd suggest a change of colour to the book jacket cover and actual theming though. Looks too fake. Looks kinda hideous. A current page number indicator would be useful as would total number of pages too somewhere. I know the thickness changes, its just not enough to show me where I am. The ability to jump to a certain number leaf is desireable should I want to return to reading at a certain point in the future too. Also, if you click through and try skipping parts quickly it takes a lot of time to catch up. Is there any plan for the flipbook viewer software itself be released? Bill: When the magnify and zoom options get going they should make it easier to read small text. Krzysztof: We have OCRed data on the server side (that is how the search works). However, we don't expose it to the user yet. You're right that the Flipbook viewer is impossible for small devices, and that text would be better. Craig: Lots of good ideas; thanks. Tien: The plan is for this to be open source software under the GPL. One more question = when ? do you have a date in mind? Hi Tien. I'm not sure when the Internet Archive will release the code. I only consulted with them in the month of October to help get the Flipbook out the door. I do know that it will probably be under the GPL and released soon. Thanks for the nice comments on the Really Simple History framework; did you have a project a few months ago that needed that functionality? did you have a project a few months ago that needed that functionality? :) i ended up using the Mike Stenhouse's solution but I thought it's not as elegant and flexible as this (Mike's site I came to b/c of the CSS framework, who I found via reading Matt Raible's blog, who I found ... (i can really go on and on) :) really cool how this net thing works ! Beautifully orchestrated effort. Now it's just the many sweet hours left of usability improvements engineering, shaving off rough corners and dodging all those misfeatures of real-world books that we don't need to mimic in a purely digital environment. I'd start at the index page, adding a text entry somewhere in the page that (instantly!) lists which title is being hovered by the mouse in some large, readable font. The image title attributes are a good start, but I know of no browser that shows them right away, and they are still better suited for adding a caption that further clarifies image content than carrying the primary means of identification, as here. Do the pictures were shown dynamically from the database? Do you use the php web server and mysql database on the server side? 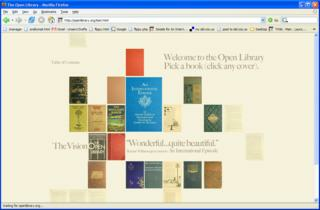 I also want to develop a web site like the Open Library. I want to know some details about this effect with ajax. Cool software! It would be cool if you made it so that you can actually close the book though, there is something satisfying to that. . .